Disclosure of material connection: The author (Derek Hansen) was provided with a free sample from the manufacturer for testing and evaluation purposes. The comments in this post (written & spoken) are of my own opinion, which I formed after personally handling the hammock and quilts. How is the size compared to the cheaper and warmer synthetic ENO Vulcan? I’ve not seen or tested the Vulcan, so I can’t speak directly to that. True. In my testing, I was able to pack both down to the size of a cantaloupe. The synthetic is 5 degrees warmer for 6 oz more weight and costs $125 less and will provide some degree of warmth wet. Guess you have to be serious about saving weight to pay that much more to be colder. 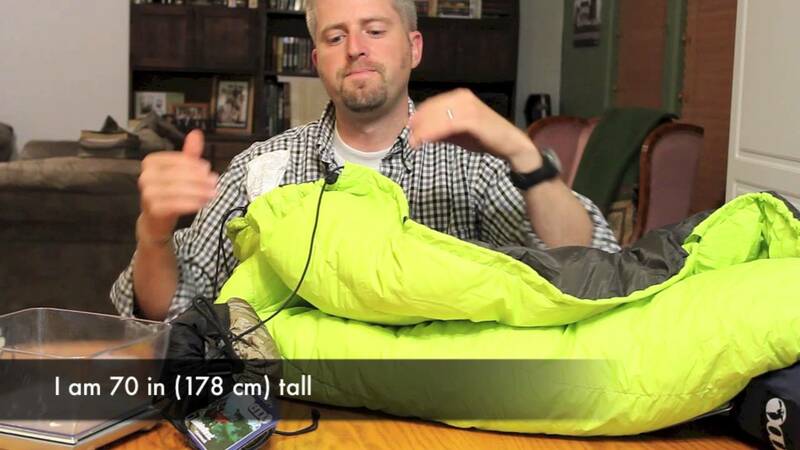 I can see how gear for long distance treks could get pricey. Not having tested the Vulcan, I can’t speak for the warmth rating, but in my own experience, synthetic has never held up to down for warmth. I had a 0°F-rated synthetic bag and I froze at 35°F during a fall camporee. I thought I was a “cold sleeper” until I tried my first down-filled bag. The warmth difference was amazing. I can take a 30°F-rated down bag into the teens and be cozy, but I can’t do that with a synthetic bag. I think synthetic has its place, however. I love my synthetic under quilts from Arrowhead Equipment and use them in specific areas and conditions. For me, there is a point where down isn’t very competitive against synthetic, especially for one-season quilts. You are correct, however, that if you are trying to maximize on weight savings, it can be expensive as you invest in top-quality down that weighs less but maintains the same volume and warmth ratings as less expensive varieties. Lol, I think they should send you the Vulcan for a side by side comparison to appease value driven car campers and compare the warmth vs the published warmth rating. I did not research the actual fabrics used either to compare durability. We managed to stay warm in 40 degree Maine weather in a skeeter beeter pro and funky forest tarp, with a reflective thermarest pad, ENO hotspot and 20 degree bags. Being a BSA troop that doesn’t backpack as Acadia doesn’t allow backcountry camping, I can’t justify the cost of an under quilt, particularly when the warmth rating is so similar to what we have found comfortable now. So far our hammocks have only hung in our yard but everyone loved them, even the young over night friend who used mine so the kids could all have fun. Maybe someday we can justify the added cost and try out that additional comfort from going padless. For now I can only say everyone who tried the skeeter beeter pro liked it better than a tent. In comparison, our hammock without an integrated bug net got exchanged because the sleeping pad and bag wouldn’t stay in and my son almost fell out. Perhaps someday we will look forward to a bigger adventure but everyone is happy for now. Thanks for all the tips and advice! The kids have enjoyed several nights in their hammocks already and requested to use them at the scout Blackwoods camporee in November. My nearly 8 year old daughter is likely the most pleased as she gets to go backyard camping when the boys are away on scout trips but apparently mom still needs to step it up a notch and roast marshmallows for s’mores. We might not go far, or be fancy, but with any luck the memories will last a lifetime. An extra thanks for the tarp hanging video and diagrams in the book from this non-knot tying mom! Thinking about making my own underquilt from one of my many 3/4 zip mummy bags. I will cut a hole in the foot end, hem it with an elastic cord and then just hang it under the hammock with a few shock cords. Just wondering if anyone else has tried this as I feel it would be a great inexpensive option for anyone that already has a few mummy bags laying around. I have seen a few pea pod style conversions on YouTube and wondered if that was what is being referred to? I have purchased a Vulcan and will be testing it soon. Will be putting a short review on this page in the next few weeks.